Almost every Terence Crawford fight progresses in the same manner. They can seem scripted, borderline predestined in that way. Crawford starts in an orthodox stance before switching southpaw and slowly begins chipping away at his opponent. Against top contenders, he might even lose a couple of rounds early. Invariably, he slowly exerts more and more control over timing, distance, and pace until he is the one calling all the shots and his opponent has been rendered inert. Saturday night at the CHI Health Center in Omaha Nebraska on ESPN was no different. Despite the highly tuned violence he employs, Crawford (34-0, 25 KO) displays almost no outward hostility. His face remains impassive no matter what is going on in his mind. The most you might see from him is a smirk, belying the sadistic glee he is evincing with his hands. In fact, the punch he threw at Benavidez at their weigh-in is about the only time I can recall him losing his cool. The local body shop may have a different impression, but in his professional life, Crawford has remained icy at all times. If Jose Benavidez (27-1, 18 KO) thought his relentless trash talking had gotten to Crawford after that weigh-in, he was to be disabused of that notion during the fight itself. Both welterweights started in the orthodox stance and began by probing at each other with range finding jabs and the occasional power shot. Crawford circled and maintained distance, while Benavidez dutifully staked out the center of the ring and sought to use his height for leverage. By midway through the 2nd round, Crawford had turned southpaw and Benavidez was coming forward, albeit not punching his way in. Periodically, Benavidez would drop his hands completely as he took a step in, only to put on his ear muffs and then shake his head when Crawford’s punches ricocheted off his gloves. The early rounds were not thrilling, but they were subtly predictive. By the 3rd round, Crawford had established his lead foot outside of Benavidez’s and was crunching right hooks into the challenger’s body with regularity. It’s a basic of footwork when fighters from opposite stances meet that whoever has their lead foot on the outside can get a better punching angle, and can also circle away without the risk of tripping. Benavidez was landing some good shots, but he was eating a lot of left crosses when he stepped in to throw them. By the 6th round, Crawford wasn’t just punching from angles and circling away, he was coming forward to do it. And so it progressed from then on. 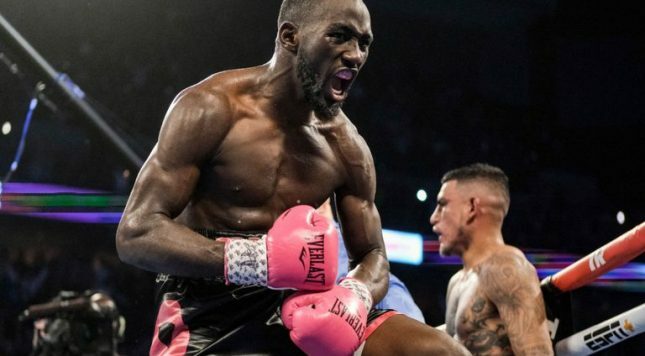 Crawford gradually stepped up the intensity as Benavidez gradually became exhausted and demoralized. ESPN announcer Joe Tessitore asked during the 8th round if this was the part of the fight where Crawford might take control, not seeing that he’d never not been in control. With a minute to go in the 9th round, Crawford unloaded a southpaw 2-3 that looped around Benavidez’s guard and sent his head swinging through the air. By the time he’d countered, Crawford had already spun away. And so it continued. The championship rounds were outright dominance by Crawford, but it never looked like he was desperate to end the fight. He seemed content, smirking malevolently as he was, to simply outclass and beat up a game but hopeless Benavidez. For all the talk, in the ring, Crawford reverted entirely to form. And that form is more utilitarian than passionate. However, with just less than a minute remaining in the 12th round, both fighters threw hard combinations at the same time, and Crawford detonated a right uppercut on Benavidez’s jaw that sent him crumbling into a heap. He rose, but Crawford leapt all over him, a pair of scorching right hooks compelling referee Celestino Ruiz to jump in and save Benavidez from any more punishment as he sagged against the ropes. Whatever passion Crawford does bring with him to the ring, it’s clear that it never controls him, because that’s not how he operates. He is the one exerting control at all times. Over pace, over distance, over his opponent, and most importantly over himself. It’s not always gripping to watch, but it is always damned impressive.